Then there's that other hard man, Mr Russell Crowe. Famed for fighting the entire Roman Empire in Gladiator while being literally stabbed in the back by a snivelling Joaquin Phoenix, Crowe was someone else who took to Twitter to slam Virgin America for not allowing him to take his kids hoverboards onto a plane. Apparently they should have told him they were banned when he booked the ticket. Finally, a Catholic priest decided to conduct Christmas Eve mass while riding a hoverboard. Even though the video shows the congregation cheering and clapping while he rolls down the aisle, according to the Guardian, his actions have gotten him suspended and forced a statement that is so bizarre it's brilliant. 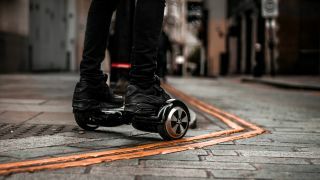 "Last December 24, 2015, before the final blessing of the Christmas eve mass, as a way of greeting his parishioners, the priest sang a Christmas song, while going around the nave standing on a hoverboard. Roll on 2016... Just not on a hoverboard.